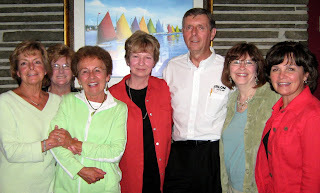 Some friends from Palmyra-Macedon High School, who graduated together just a few years ago, got together recently --- Judy, Caroline, Marnie, Marcia, Jim, Sharon, and Mary Ann. Some of us (but not all of us!) remembered that Schooner's Restaurant where we had lunch was a hot spot in the 60's known as Gingham Town or "G-Town". Jeanne Simpson isn't in the picture, but she joined Nancy Hicks, Pat Pauly, Linda Bachman, and I for some studio time. 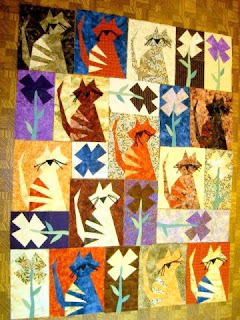 This is the cute kitty kat quilt top that our niece, Jenna, started last year at a workshop and recently completed. She'll be bringing it with her when she visits next month to work on the quilting.